You should know a NEW holiday system is in effect from 2014 at government offices including Post Office and major Banks, where an additional business day is designated as Holiday, if a Holiday falls upon a WeekEnd or another Holiday . 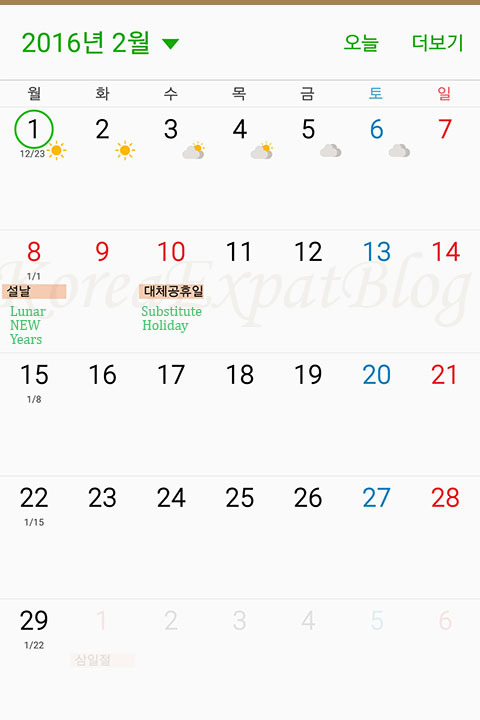 also that Lunar NEW Years and ThanksGiving Holidays each span a good full-three days, because a bulk of the population originally from the suburbs, now work and dwell in Metropolitan SEOUL and need a few days to return home to pay respect to their elders in Korea’s two most traditional holiday season . stores in the three most busy subway hubs of BanPo Bus Terminal, KangNam and JamSil Subway stations close ONLY ON the actual Lunar NEW Years which is February 8 Monday . then most stores in underground pathways in subways hubs mostly in the old downtown SEOUL, including City Hall, MyeongDong, JongRo, CheonGaeCheon and DongDaeMun would close the traditional three days from February 7 Sunday to 9 Wednesday . under-ground shopping arcades are managed by SEOUL Facilities Administration head-quartered in CheonGaeChun .